While 2018 was a year of economic divergence, PIMCO expects 2019 to be a year of convergence toward lower growth rates. The first chart shows how U.S. equity markets reflected the era of U.S. exceptionalism through the third quarter in 2018. The trend reversed in the fourth quarter, however, ending the year in negative territory, with the U.S. equity market (blue line represented by the S&P 500 Index) beginning to “catch down” to global equity markets. While the U.S. expansion is close to becoming the longest on record, it is important to remember that markets don’t need to wait for a recession to experience volatility. As we predicted last year, volatility normalized to historical averages (second chart) due to a combination of concerns about slowing growth, the Fed’s path of policy rates and broader geopolitical uncertainties. In 2019, we believe investors should expect ongoing bouts of volatility as the global expansion continues to age and markets respond to higher uncertainty. In a world where volatility is likely to be higher than in the recent past, we believe investors should focus on how to embed resiliency in portfolios, emphasizing diversification and liquidity while preparing to go on the offense as selective opportunities arise. Day-to-day performance can reflect noise from a range of factors, so it will be important to keep a longterm perspective and maintain caution in 2019. Timely insights on global political developments and implications for investing. 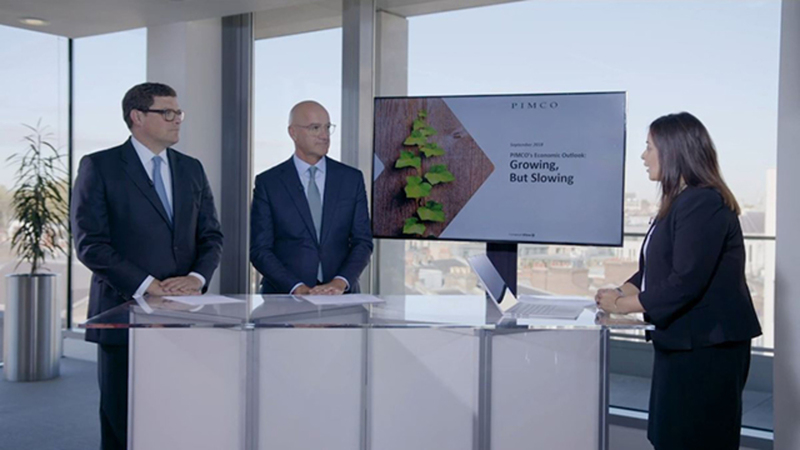 PIMCO’s Global Economic Advisor and CIO Global Fixed Income discuss the causes of what we predict will be a “growing, but slowing” global economy over the cyclical horizon. Past performance is not a guarantee or a reliable indicator of future results. All investments contain risk and may lose value. Investing in the bond market is subject to risks, including market, interest rate, issuer, credit, inflation risk and liquidity risk. The value of most bonds and bond strategies is impacted by changes in interest rates. Bonds and bond strategies with longer durations tend to be more sensitive and volatile than those with shorter durations; bond prices generally fall as interest rates rise, and the current low interest rate environment increases this risk. Current reductions in bond counterparty capacity may contribute to decreased market liquidity and increased price volatility. Bond investments may be worth more or less than the original cost when redeemed. Equities may decline in value due to both real and perceived general market, economic and industry conditions. Investing in foreign-denominated and/or -domiciled securities may involve heightened risk due to currency fluctuations, and economic and political risks, which may be enhanced in emerging markets. Currency rates may fluctuate significantly over short periods of time and may reduce the returns of a portfolio. High yield, lower-rated securities involve greater risk than higher-rated securities; portfolios that invest in them may be subject to greater levels of credit and liquidity risk than portfolios that do not. Mortgage- and asset-backed securities may be sensitive to changes in interest rates, subject to early repayment risk, and while generally supported by a government, government-agency or private guarantor, there is no assurance that the guarantor will meet its obligations. Inflation-linked bonds (ILBs) issued by a government are fixed income securities whose principal value is periodically adjusted according to the rate of inflation; ILBs decline in value when real interest rates rise. Treasury Inflation-Protected Securities (TIPS) are ILBs issued by the U.S. government. Certain U.S. government securities are backed by the full faith of the government. Obligations of U.S. government agencies and authorities are supported by varying degrees but are generally not backed by the full faith of the U.S. government. Portfolios that invest in such securities are not guaranteed and will fluctuate in value. Management risk is the risk that the investment techniques and risk analyses applied by PIMCO will not produce the desired results, and that certain policies or developments may affect the investment techniques available to PIMCO in connection with managing the strategy. Derivatives may involve certain costs and risks, such as liquidity, interest rate, market, credit, management and the risk that a position could not be closed when most advantageous. Investing in derivatives could lose more than the amount invested. Diversification does not ensure against loss. There is no guarantee that these investment strategies will work under all market conditions or are suitable for all investors and each investor should evaluate their ability to invest long-term, especially during periods of downturn in the market. Investors should consult their investment professional prior to making an investment decision. Correlation is a statistical measure of how two securities move in relation to each other. The correlation of various indexes or securities against one another or against inflation is based upon data over a certain time period. These correlations may vary substantially in the future or over different time periods that can result in greater volatility. The credit quality of a particular security or group of securities does not ensure the stability or safety of an overall portfolio. The quality ratings of individual issues/issuers are provided to indicate the credit-worthiness of such issues/issuer and generally range from AAA, Aaa, or AAA (highest) to D, C, or D (lowest) for S&P, Moody’s, and Fitch respectively. PIMCO does not provide legal or tax advice. Please consult your tax and/or legal counsel for specific tax or legal questions and concerns. The discussion herein is general in nature and is provided for informational purposes only. There is no guarantee as to its accuracy or completeness. Any tax statements contained herein are not intended or written to be used, and cannot be relied upon or used for the purpose of avoiding penalties imposed by the Internal Revenue Service or state and local tax authorities. Individuals should consult their own legal and tax counsel as to matters discussed herein and before entering into any estate planning, trust, investment, retirement, or insurance arrangement. The Gross Domestic Product (GDP) is a measure of output from U.S. factories and related consumption in the United States. It does not include products made by U.S. companies in foreign markets. Standard deviation is a measure of the dispersion of a set of data from its mean. The more spread apart the data, the higher the deviation. It is not possible to invest directly in an unmanaged index. Forecasts, estimates and certain information contained herein are based upon proprietary research and should not be interpreted as investment advice, as an offer or solicitation, nor as the purchase or sale of any financial instrument. Forecasts and estimates have certain inherent limitations and, unlike an actual performance record, do not reflect actual trading, liquidity constraints, fees and/or other costs. In addition, references to future results should not be construed as an estimate or promise of results that a client portfolio may achieve. Statements concerning financial market trends or portfolio strategies are based on current market conditions, which will fluctuate. There is no guarantee that these investment strategies will work under all market conditions or are suitable for all investors, and each investor should evaluate his/her ability to invest for the long term, especially during periods of downturn in the market. Outlook and strategies are subject to change without notice. This material contains the opinions of the manager and such opinions are subject to change without notice. This material has been distributed for informational purposes only and should not be considered as investment advice or a recommendation of any particular security, strategy or investment product. Information contained herein has been obtained from sources believed to be reliable, but not guaranteed. No part of this material may be reproduced in any form, or referred to in any other publication, without express written permission. PIMCO is a trademark of Allianz Asset Management of America L.P. in the United States and throughout the world. ©2019, PIMCO. Be the first to get our quarterly analysis on the economy and financial markets.